You may be surprised to discover that Singapore is truly a garden city, much of it wrapped in luxuriant greenery. So if you need a break from the city's bustle, we can show you where to find everything from manicured gardens to wild jungle. The Botanic Garden is certainly a highlight - a wonderful place for a quiet stroll, a family outing, or for that exercise you've been meaning to catch up on. The Nature Reserves are a bit more remote, but in Singapore, nothing is really very far away. 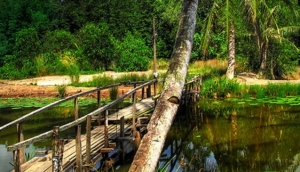 Whether you fancy a hiking or biking tour, want to explore the rich jungle flora and fauna, or just feel the need for a good adventure, check out our favourite Singapore natural getaways.